It all seemed so hopeful when we arrived for our final warbler walk and the temperature was already at 50—four degrees warmer than the temp when we finished up our final Park Point walk. But it stayed stuck at 50 all morning and, as if to keep our spring walks consistent, the walk ended with a steady but light drizzle. So the weather didn't cooperate, and neither did migratory warblers. Most of the group saw a Wilson's Warbler, and Leslie, one participant who had to break ahead of the group to deal with a work phone call, caught what sound like a flock of migrant warblers, but that was probably it for the migrants. Fortunately, that was NOT it for bird sightings, despite the fact that our species total was only 32 (plus a "traill's-type" flycatcher—either an Alder or Willow, but it wasn't saying which). We saw and heard Yellow Warblers, American Redstarts and Common Yellowthroats (also both warblers), from start to finish, though only one (the one pictured above) would sit still without branches obscuring it for me to get focused. Did I mention how bad the light was? 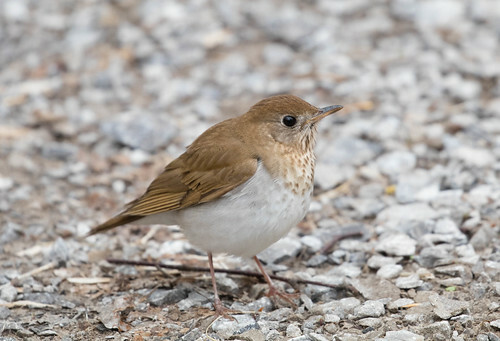 We saw Veeries from the start, including, I think, the one who was so cooperative when I was there alone last Wednesday. Today was another thing—we got nice but distant, quick looks, so this photo is from last week. 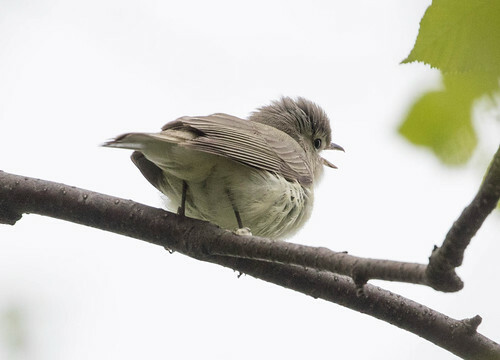 We saw and heard a few Red-eyed Vireos, giving me an excuse to blather about Louise de Keriline Lawrence counting 22,197 individual Red-eyed Vireo songs by one individual on May 27, 1952. But I spaced on her name, the date, and the precise number of songs until I found my blog post via my cell phone. It's a long entry—I got two radio programs out of it, and left out several paragraphs. 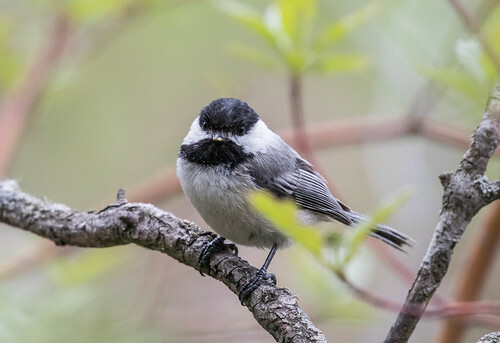 But scroll through this if you want to read about a surprisingly interesting bird and a bit about the woman who followed one all day just to count his songs. I didn't get any photos of Red-eyed Vireos today, but here's one anyway. The reason I'm posting the Red-eyed Vireo photo is for you to compare that with the photos I did get today of the Warbling Vireo. 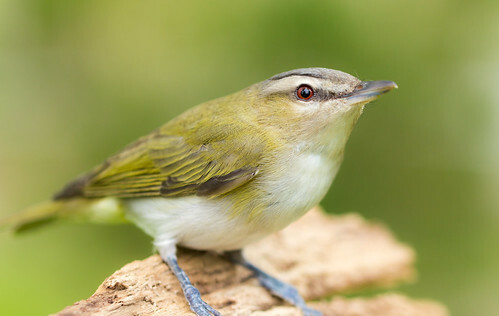 The Red-eyed Vireo's red eye isn't always apparent (some young birds don't have a red iris yet, too), but it has a pretty distinct dark eye line, a gray cap, and a noticeable clean whitish eyebrow line. 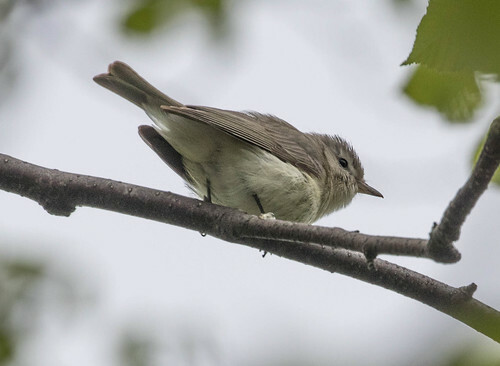 The Warbling Vireo has just sort of an eye line, sort of an eye ring, sort of a greenish/brownish/grayish back. And in the case of today's bird, it was just sort of cooperative for photos. I call it the Sort-of Bird. One of the things I talked about with the vireos today was the sharp "tooth" at the tip of the bill. Vireos are fairly closely related to shrikes, which have the same weaponry. 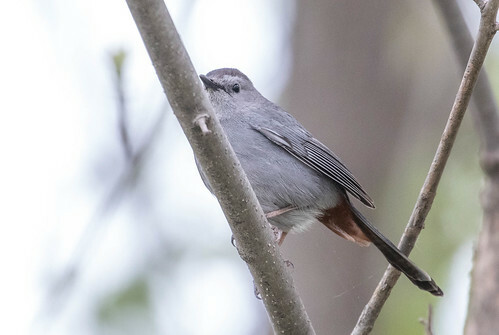 Two catbirds were briefly cooperative, so focused on each other that they ignored us. These photos are of just one, though. We saw and heard orioles throughout the morning, but didn't spot any building nests yet. I didn't get many photos. Birds that were nesting abounded. Robins had been carrying nesting materials quite a bit the last few weeks—today the females must have been busy incubating, but males were singing. We had noisy baby Hairy Woodpeckers. I neglected to take a photo of the hole—will have to go back this week with my tripod and directional microphone to get videos. But I did get one recording that you can listen to here. I edited out the lowest frequency sounds, getting rid of most of the background traffic noise. We also came upon this chickadee sitting oh, so patiently. I finally noticed that the poor thing had food in its beak, and when we pulled back a bit, we saw it carry it to its nest. The nest was in a very short broken tree—less than 3 feet tall—so we didn't investigate much. I didn't want any chipmunks or other nest predators to discover it. I played Sora, Virginia Rail, and Marsh Wren recordings at the first marsh, but none of those species responded at all. Played them at the second marsh, and voila! One rail flew in almost instantly and skulked for a bit. Then s/he called, and another responded. I don't like disturbing nesting birds, but these have just arrived, and a few people wanted better looks, so I played a few more calls than usual, giving us a few distant looks. That would have been plenty for us to have felt like we had a quality experience with them. But then, after I was done playing recordings, one started skulking about very close to shore right below our path. Pip is living up to her name as a Birding Dog: the bird ignored us all, feeling safe and hidden behind lots of branches, allowing me to take a whole bunch of photos as it skulked and picked up bits of food. The light was bad, so the ISO is pretty high, making the details of whatever I photographed it eating pretty poor. But what a kick to see him or her so close! It was drizzling while we were heading back, and although I'm not related to the Wicked Witch of the West and won't melt in a bit of rain, the electronics in my camera aren't so safe from water, so we walked pretty quickly as we savored the jolly encounter with the Sora as our Duluth Audubon Spring Warbler Walks drew to a close. Christine Dean took this photo of me before we started out today. At the end of the walk, my warm coat, gloves, and scarf were equally essential. Yes, today is May 30. But this is Duluth.